KG-RADII - Berger et al. HR diagram with updated stellar radii calculated by Berger et al. (2018) and effective temperatures from Mathur et al.(2017). 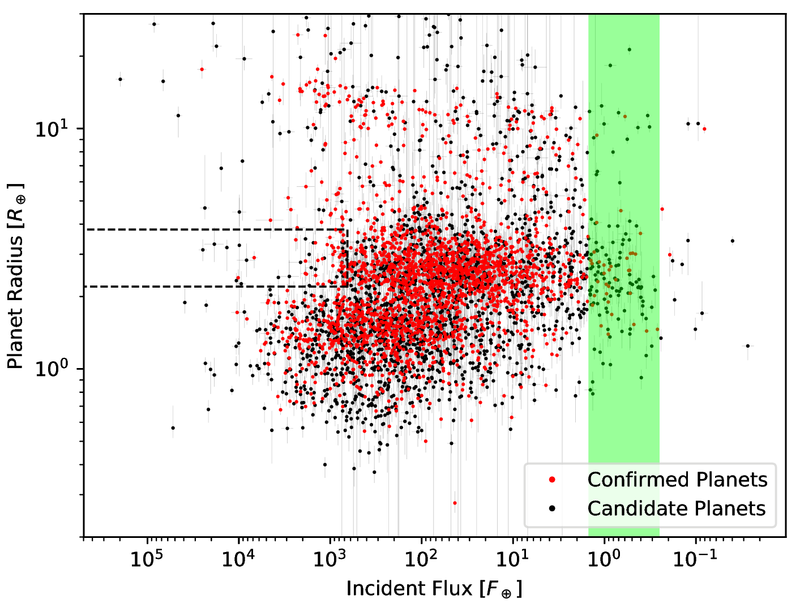 The Kepler sample of stars is currently one of the most well-studied samples of stars, yet before Gaia DR2, there were primarily photometric constraints on their radii, resulting in 30-40% fractional uncertainties for the vast majority of these stars. 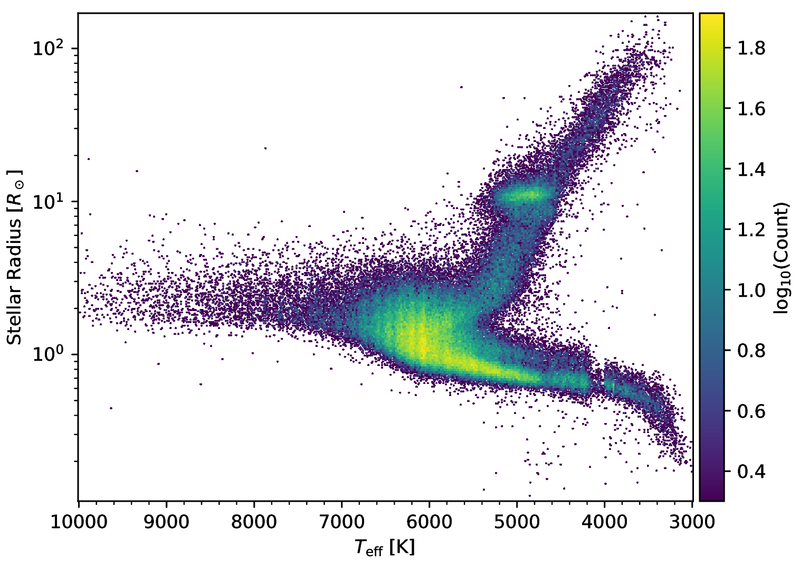 However, with the parallaxes provided by Gaia DR2 and the wealth of data available for the Kepler field synthesized by the most recent Kepler Stellar Properties Catalog (Mathur et al. 2017), it is now possible to constrain Kepler radii to a median uncertainty of ~8% and luminosities to a median uncertainty of ~7%. This, in turn, allows for a better understanding of the evolutionary states of the Kepler field's stellar population through the resulting precise stellar radii. This work also reveals a secondary main sequence for cool stars with larger radii, which represent a sample of potential binaries. Improved stellar radii and luminosities translate directly into improved planet radii and incident fluxes, both of which allow identification of confirmed and candidate planets in the habitable zone, an inflation trend in hot Jupiters, the gap in the distribution of planet radii around 2 Earth radii, and planets within the previously-deemed "hot super-Earth desert" (Lundkvist et al. 2016). The paper that details this work can be found here: Berger et al. 2018 . You can refer to the KG-RADII data products in papers or webpages using the DOI http://doi.org/10.17909/t9-bspb-b780. The KG-RADII data release includes two catalogs, one containing updated stellar properties, and the other updated exoplanet properties. These catalogs are available as the tables "exoplanet_parameters" and "stellar_parameters" in the "HLSP_KG_RADII" context in MAST CasJobs . Exoplanet Parameters - with columns: KIC_ID, KOI_ID, Planet_Radius [Earth radii], Planet_Radius_err_upper, Planet_Radius_err_lower, Incident_Flux [Earth fluxes], Incident_Flux_err_upper, Incident_Flux_err_lower, AO_Binary_Flag (0 = no AO-detected binary, 1 = AO-detected binary). 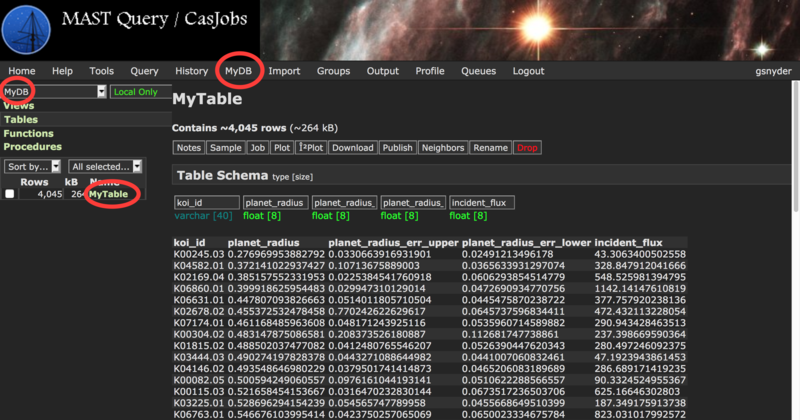 The KG-RADII catalogs are available as two tables in the "HLSP_KG_RADII" context in MAST CasJobs, which allows for powerful SQL queries, and the ability to cross-match the KG-RADII catalog with other large catalogs in CasJobs (such as the Kepler and GAIA databases and other HLSP catalogs). From the "Query" tab, select "HLSP_KG_RADII" from the Context drop-down menu. You can then enter your query. In this example, we are doing a simple query to get all the KG-RADII radii and fluxes from the exoplanets catalog, which you could use to reproduce the first figure, above. For short queries that can execute in less than 60 seconds, you can hit the "Quick" button and the results of your query will be displayed below, where you can export them as needed. For longer queries like this one, you can select into an output table (otherwise a default like MyDB.MyTable will be used), hit the "Submit" button, and when finished your output table will be available in the MyDB tab. You can access your output tables containing the results of past queries with the MyDB tab, where you can also export the results in a variety of formats (FITS, CSV, etc). In this example we see the results of the query from the example on the left. In addition, you can explore what sort of MAST database tables are available to query. If you change the Context drop-down menu to select "HLSP_KG_RADII", you will see the full catalog tables. Clicking on the link will display a Note section with information on the available content of the database table. You can also click on the Sample button to display some random rows from the table, to get a better idea of the content.